The new Virus is one of the most affordable ever and currently the cheapest way to get a slice of Access' Total Integration technology - but does cheaper mean compromised? So, down to business. The various incarnations of the Virus have pretty much reached legendary status amongst synth aficionados, and not without good reason. They've always combined great usability with a sophisticated sound that suits many different genres — and not just dance music, although they absolutely excel in that area. While each revision of the Virus keyboards and modules has added more features, polyphony and raw DSP power to the basic recipe, Access (the German company that makes the Virus) took quite a bold step a few years back in replacing the successful revision C models with the TI range. SOS previewed them back in December 2004, and Mark Wherry's excellent review from the December 2005 issue is still a great introduction to the TI (Total Integration) concept and the three 'premium' Virus TIs — the Desktop, Polar and Keyboard. In case you don't have it handy, there's a recap in the 'Totally Integrated' box. One drawback of the Virus TI models available up until now — the KB, Indigo and Desktop — has undoubtedly been cost. Value for money is not in question; these are phenomenal synths by any standard, and well worth their asking price. But even the keyboard-less Desktop typically costs £1300, which would make almost anyone think twice as their mouse pointer hovers nervously over that web site 'Buy' button — heaven knows, mine has more than once. Enter the £800 Virus TI Snow. 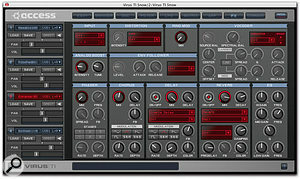 The Virus Control plug-in stays tightly integrated with the Snow hardware — the first time you run it it syncs all patch locations and, if necessary, updates the Snow's firmware.Supplied as standard with the Snow comes an in-line AC adaptor (which is required at all times, even if you're working via the USB connection), a USB cable, a Quickstart manual in English, Spanish, German and French and, possibly a first for any synth, a shoulder bag. This is a trendy Logstoff M4 Messenger, which is big enough to take the Snow and its associated bits and bobs, and have room left over for a few personal items. You might squeeze a 12-inch laptop into it too, but I wouldn't recommend it. Also, it has virtually no padding, so I'd advise against chucking it around too much when carrying the Virus. Rear-panel connections consist of an inlet for the power adaptor, a B-type USB socket, a pair of quarter-inch audio input sockets (with software-controlled variable sensitivity), and a matching pair of +4dB quarter-inch audio outputs. A summed mono signal is available from the right channel socket, and the left channel socket allows a pair of conventional stereo headphones to be plugged in — clever. Apparently, the Snow's D-A converters operate at 192kHz/24-bit, and though no sampling rate is given for the A-Ds, they are 24-bit too. Finally there's MIDI In and Out on five-pin DIN ports and a security anchor slot. Let's start by looking at the Snow in its role as a 'traditional' synth module, driven via MIDI by a controller keyboard or sequencer. Used this way, you essentially have a choice of two operating modes: Single an Multi. Single, as you might expect, gives you access to just one of the Snow's 1024 patches at a time, driven by a single MIDI channel. 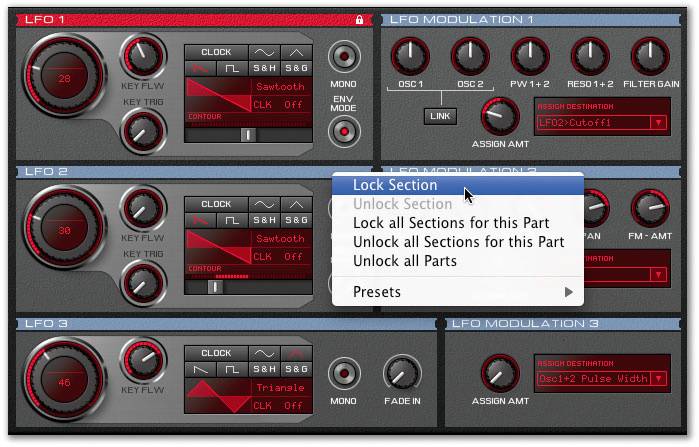 Multi offers multi-timbral operation, where up to four parts can be assigned a separate (or indeed the same) MIDI channel, and have key ranges, transposition, pan position and other playback attributes defined. You can store these setups in one of 64 Multi presets, and as each of the part 'slots' within these are separate from the 1024 single patches you won't get that annoying situation that has plagued many a synth over the years, where modifying or overwriting a patch in one multi can inadvertently wreak havoc in another. The TI Snow's rear panel includes stereo audio I/O, MIDI In and Out ports, a USB port for the all-important 'Total Integration' and a socket for the external PSU.Working in Single mode, the Snow's quite minimalist user interface is easiest to understand. Calling up banks and patches is easy and quick: hit the Bank button and you can switch between the eight ROM and eight RAM banks using the two rows of eight buttons above. With the bank selected, the same two rows of buttons then allow you to choose from the 64 patches in each bank. After recalling a patch, the LCD prominently displays the patch name and its memory location. A patch category (such as Bass, Lead, Pad and so on) is also displayed, along with what looks like a mobile phone's battery indicator, which actually gives a guide to the complexity of the patch, and how 'efficient' it is in terms of polyphony. Then, along the bottom of the LCD, three parameter names are shown, corresponding with the three 'soft' knobs beneath the LCD. As you can guess, these give easy access to various synth parameters, but while some patches have the knobs assigned to familiar parameters like filter cutoff and pulse width, in other patches it gets a little more arcane: 'elevate', 'scream', 'destroy', 'infect' and 'hype' were some of the more unusual names I spotted. These knobs are supplemented with dedicated filter cutoff and resonance knobs which, via a shift key, also adjust filter and amp envelope amounts, and taken as a whole they allow a surprising amount of flexibility while demanding almost zero synth-programming knowledge! I couldn't discern any 'stepping' of values when sweeping the knobs either, and everything seemed super-smooth. To get beyond this admittedly rather shallow editing depth there are two ways you can go, depending on how much control you want. The key to both is the Edit button. Hit and release the button and the Snow invites you to select an Edit Menu — that means pressing one of the upper row of eight buttons, reading the names printed beneath, such as Osc 1, Osc 2, Filters, Mod and so on. The Snow then displays an 'easy' edit screen offering up to three of the most important and 'powerful' parameters associated with that part of the synth architecture, which can then be adjusted with the knobs beneath the LCD. When you've finished tweaking one set of parameters you can press one of the other seven buttons to move on to more, or press Exit to finish. It's a beautiful system that gives you real power to tweak or even completely transform a patch in no time at all, while cutting through the complexity of the synth architecture. When Easy editing doesn't provide enough control, a variation on the same approach gives you access to every single parameter that makes up a Virus patch. This time you press and hold the Edit key before selecting the button corresponding to which part of the patch you want to edit. Now, with so many more parameters on offer, the LCD shows three at a time, and a pair of bottom row buttons marked 'Parameters' are used to cycle through screenfuls of parameters. The potential for getting lost here is greater, but is still minimised by clear labelling in the LCD. Editing sounds in Multi mode works in exactly the same way, except that the Multi menu parameters are now enabled, and you can use the Part button followed by buttons one to four (on the bottom row of eight) to select which part you want to edit. Access' 'Total Integration' provides a way to incorporate your Virus seamlessly into a DAW setup, via a single USB cable. 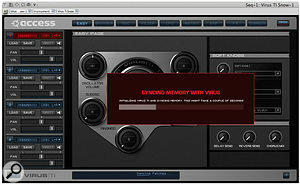 The USB connection handles both MIDI and audio and allows your Virus to appear in your DAW as though it was a virtual instrument plug-in, providing an intuitive, extended user interface. 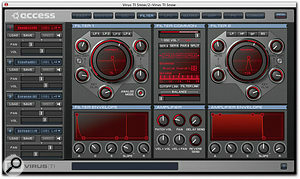 Through this Virus Control plug-in your TI gets super-tight MIDI playback timing and becomes fully integrated with your DAW mixing environment. 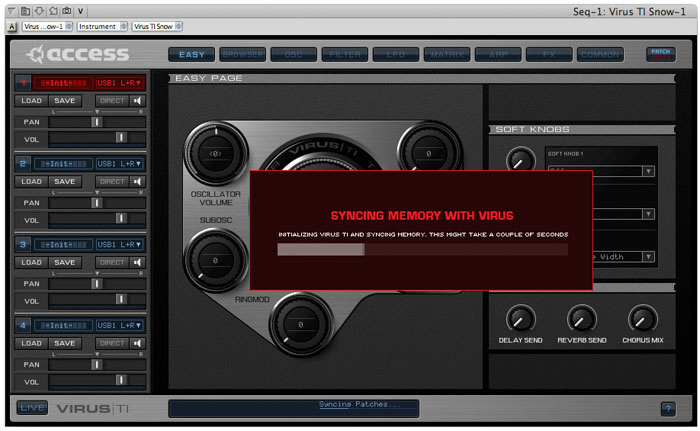 The soft-synth-like behaviour lets you automate synth parameters really easily — no messing about with MIDI continuous controller values here — and because Virus Control settings are saved in your DAW's project files, you can enjoy total recall of Virus settings as you open them. And the load on your computer's CPU? Nothing, of course, or at least next to nothing. As an added bonus, a Virus TI simultaneously becomes a simple USB audio and MIDI interface, even while it's being a synth! But what if you're not a computer-based DAW user, or you want to gig with your Virus as well? 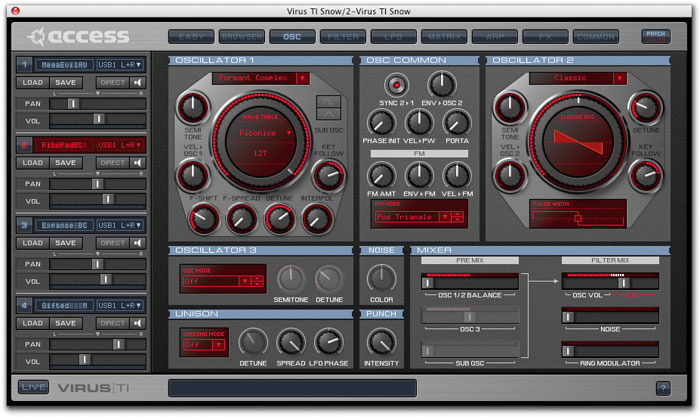 In this case, you can forget the Total Integration and regard the Virus TI Snow as a normal synth — like the other models in the range, the Snow has conventional audio outputs and MIDI sockets, and includes suitable modes for working with single patches or 'multi' setups. Essentially, then, the TI is a conventional synth, DSP box, audio/MIDI interface and control surface, all rolled into one, and while it blurs the distinction between conventional and 'virtual' operation, it only ever does so in a useful way. Before we get on to the TI bit of the TI Snow, I'll quickly indulge myself and take this opportunity to gush about the Virus sound. In a word, it's glorious. It doesn't take much auditioning and tweaking of patches to make you wonder why you should ever bother with any other synth, especially flaky soft synths or temperamental hardware analogues. Everything you could want is here: warmth, weight, power, presence, but also subtlety, delicacy, and expressiveness. It jumps between styles with the greatest of ease, knocking out brash Kylie-pop blips, vast trance pads and leads, ambient drones and washes, worrying glitchy hisses, weird Boards Of Canada lines, and, except for anything that sounds much like an acoustic instrument, everything else besides. The supplied patches are excellent, and for the most part are immediately usable in a musical context, avoiding the superficiality of those 'wow' patches that some synths use to sound good during the two minute in-shop demo but are no good for anything else. As I put the Snow through its paces I found it an almost constant source of inspiration, for both live playing and writing. You can't really say fairer than that. 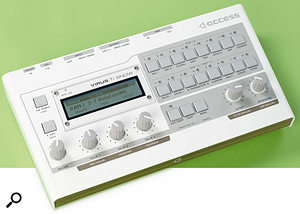 The Snow's synth architecture is exactly the same as that of the more expensive TI models, so all the additional sound-sets available from www.access-music.de are compatible. It's basically a three-oscillator, two-filter, three-LFO and two-envelope arrangement, which sounds simple enough, but, partly thanks to a very flexible modulation matrix, offers phenomenal power, especially since the introduction of the version 2 firmware at the beginning of 2007. For example, two of the oscillators now offer no less than eight operating modes: Classic, Hypersaw, Wavetable, Wave PWM, Grain Simple, Grain Complex, Formant Simple and Formant complex. A Hypersaw oscillator can sound like as many as nine individual sawtooth oscillators, detuned if necessary, while the new grain modes resample pitch-shifted wavetables to derive completely new waveform spectra. The formant modes, on the other hand, essentially produce filter-bank effects, with playback pitch independent of a fixed harmonic spectrum, again generated by the Virus's 100 wavetables. Predictably, the filters are multi-mode, and include a Moog emulation with variable cutoff steepness. An associated saturation module provides various kinds of distortion at the voice level, and can also operate as an additional low-pass filter. The filters are all you'd hope for, and can do smooth and silky as well as fat, with high resonance amounts capable of producing tweeter-roasting or room-shaking energy. Importantly, all the Snow's effects are completely independent, and are provided on a per-part basis. So it's perfectly possible (though in practice polyphony-sapping) to use four independent reverbs, and the more CPU-efficient delay, phaser, distortion, chorus and EQ are seriously good. Should you want to treat audio from elsewhere in your studio with the Snow's filters and effects, there are the rear-panel audio inputs. A per-patch setting lets you choose whether this audio input will be permanently audible, or if it'll only be heard when you trigger the envelope generators by pressing a key. Input signals can be pressed into service for other tasks, too — they can either become a modulation source, thanks to an 'Input Follower' that tracks level; provide one of the feeds to the ring modulator; or be the modulator component in the vocoder. The inputs' sensitivity is switchable in the Config menu, and you can even dial in a skewed frequency response so that a turntable can be connected without having to pass its output through an RIAA preamp first. Part of the TI OS 2.7 update, Atomizer was an unexpected addition to the Virus TI range's capabilities. It's essentially a looping and beat-slicing tool and it only really makes sense for live use. Atomizer takes the signal appearing at the Snow's hardware inputs and analyses it for tempo and beat structure. It can then be manipulated in real time by playing notes on a MIDI controller, moving mod and pitch-bend wheels, and pressing front-panel buttons. The effect is to temporarily loop, reverse or gate short, rhythmically anchored sections of the signal in a overtly glitchy, breakcore sort of way. It's fun, if somewhat limited in scope, and a bonus to have in addition to the usual synth functions. You can even run one Atomizer part alongside three normal synth parts on the Snow, and further treat the Atomizer sound with the usual part effects. The Snow is clearly a hell of a synth by any standards, but its pièce de résistance is the USB-based Total Integration system. Getting started with the system requires you to install the drivers, Virus Control plug-in and associated documentation on to your system, and Mac OS 10.4.6 or later is supported, as well as Windows XP Home and Professional with Service Pack 2 or Vista 32-bit. I ran into conflicting instructions about how to do this on my Macs and the result was initially a bit messy. The Quickstart guide says to only attach the Snow via USB when instructed, but it turns out that for the Mac it should be attached before you run the installer, so that the unit's firmware can be checked and, if necessary, automatically updated. A re-install did the trick, but the initial confusion took the shine off my first steps with the TI experience. The tabbed interface of Virus Control spreads the synth's parameters and settings over 10 editing pages, but it's very clearly laid out. Shown in these screenshots are pages for editing the oscillators, filters and effects.Happily, when you're up and running, TI is great. Access currently approve five DAWs as compatible hosts (see the 'Hosts' box), and I did most of my testing in Ableton Live 7. After instantiating the special Snow-specific Virus Control plug-in, the Snow's LCD reports that it's running in Sequencer mode, while the plug-in gives access to all the part settings and synth parameters, as well as an enhanced patch-management system. It takes 10 tabbed pages of the roughly 900 x 500 pixel plug-in window to present all this info, but the resulting screen real-estate means that parameters can be presented in an attractive, graphically-oriented manner, as with most soft synths. As you'd expect, tweaking a parameter on screen (and perhaps recording that into your DAW as automation data) results in the Snow instantly responding. What's nice, though, is that this works the other way round too — you can continue to work with the Snow's physical controls as if it were in Multi mode, selecting and editing patches in any part using the soft knobs, easy edit or the 'full monty' edit mode. Then it's the plug-in that updates, and you've effectively got a highly specific control surface. Nor is it an either/or thing — you can jump between plug-in and hardware controls whenever you wish. There are a few things that can only be achieved with the Virus Control plug-in, though. One is searching for patches by name — there's a text field and associated search button on the Browser page for this. Another is graphical editing of the arpeggiator. And there's another really neat feature — Section Lock. This allows you to basically freeze the parameters for one or more parts of the synth architecture as you switch patches. So if you had loaded up a slowly evolving pad sound and wanted to try that same basic 'shape' with different timbres you can lock just its envelope generators while you load up some other patches. This is done with just a few right-clicks of the mouse, and some section lock presets are even provided. Arming a MIDI track to record a Virus part differs from DAW to DAW, of course, but once you've done it you start to discover more about the nature of the USB integration, particularly that it's unavoidably beset with latency. Now, generally this is no worse than with any other soft synth, and can normally be reduced to unnoticeable levels by setting your DAW buffer size to 128 or 256 samples. If you need a crisper response, there's a work-around built into the Virus: Direct mode. This can be engaged for one part at a time by clicking the 'Direct' button nestled in amongst the part's parameters in Virus Control. That part is then muted from the USB audio feed into the DAW and instead emerges from the Virus's hardware audio output pair, which you'll need to be monitoring through a mixer or zero-latency audio interface. While any reliance on additional hardware seems a little inelegant in the light of TI's fundamental ethos, Direct mode does at least ensure near zero-latency recording, regardless of DAW buffer size. Virus OS 2.7 also introduces a Live mode, engaged with a single button at the bottom left of Virus Control. This specifically exists to lower Virus Control latency in Ableton Live, FL Studio and Sonar, as well as Digital Performer 5 (which is not an officially supported DAW but is specifically mentioned on the Access web site). Playback of recorded parts is completely straightforward, and is sample accurate in the 'official' host DAWs. Part volume and pan position can be adjusted from Virus Control or the Virus itself, but they'll also respond to MIDI CC data from the MIDI tracks that drive them. You're not obliged to send all four parts down the same USB-based output pair either — an additional stereo pair is always available, and you can choose to have up to three independent audio pairs feeding your DAW if you're willing to sacrifice the Snow's input channels. These additional stereo USB channels allow you to route Virus parts individually into your DAW, and treat them with your favourite plug-ins. Here, in Virus Control's LFO page, LFO 1 has been locked already and LFO 2 is about to be. 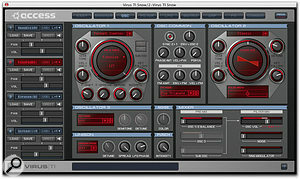 Now, when a new patch is selected, these LFO settings will be retained, opening up all sorts of possibilities for sound design and experimentation.When using Virus Control there's no concern over memory locations, and you can load up part slots with patches from any banks already in the Virus, or from banks saved elsewhere on your computer. The 'memory', such as it is, is your DAW project file, so you get to enjoy full recall of different Snow setups every time you open a project in which Virus Control is present. Throughout the course of testing I couldn't find any flaw in this scheme — software and hardware were completely reliable, and all the claimed benefits of Total Integration were borne out in practical use. It's a really impressive system. There are one or two practical considerations concerning Virus Control. One thing it doesn't offer is the full range of 'utility' parameters that the hardware unit itself does: you can't, for example, use it to change hardware input sensitivity or LED brightness. You also shouldn't try to include it in a faster-than-real-time track freeze, although a conventional real-time bounce should be fine. MIDI Patch Change data can be sent to Virus Control parts, and they'll act on it (sometimes after a very short delay), but in general this is not an easy area to work with. For starters you can't automate patch changes from the plug-in in the way you can with other parameters, so instead have to work out how to insert combined bank/patch change messages into your DAW tracks, paying attention to the way MIDI's 0-127 patch values tie in with the Virus's 'eight groups of eight patches' layout. Possible, but not too friendly. Finally, if you're a person who lets their computer sleep a lot, you might have to change your habits. The TI USB link effectively drops if your computer goes to sleep while it's enabled, and no amount of USB lead re-plugging or power-cycling of the Snow will get it going again. However, as a committed sleeper myself, I found everything was fine so long as I closed any projects that included Virus Control and put the Snow in standby before letting my Mac sleep. Again, a minor inconvenience at most. Being a DSP-based system, patch complexity in the Virus Snow comes at a cost: polyphony. Using reasonably straightforward sounds, you'll be able to squeeze out above 50 voices in Single mode. At worst, a patch using Grain Complex oscillators, the analogue filter emulation, all the effects, including reverb, and complex mod matrix routings, might give you no more than eight or nine voices. Polyphony count per patch is also slightly reduced in Multi or Sequencer mode, and you'd want to be very careful not to dial up four parts all with complex oscillators, analogue filters and reverbs. In practice, I never came up against polyphony limitations, and for those times when it could become an issue it's possible to specify which part or parts should be given priority, to avoid note-stealing. 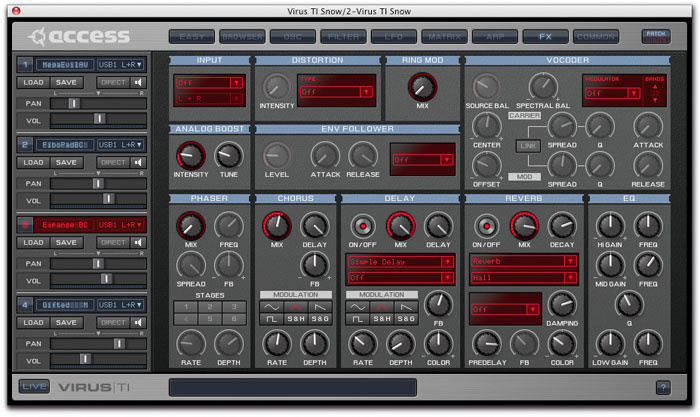 Virus synths have always been a class act, and the TI Snow upholds that tradition admirably. At the heart of it all is the sound — it's engaging, sophisticated, and flexible enough to work equally well for mainstream pop, virtually any dance style, music for picture and sound design, along with the most experimental electronica. 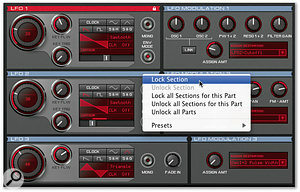 The Atomizer looping and beat-slicing tool (see box elsewhere in this article) is a handy additional feature, too, and further extends the range of application. The user interface is about as good as could be imagined for a small unit with relatively few physical controls, and allows the user to decide on the level of programming complexity required without ever becoming confusing or relying on unfathomable menu hierarchies. Total Integration, for those who can make use of it, is just great. Minor latency and compatibility considerations aside, you really feel like you're having your cake and eating it, and the ability to seamlessly jump between working with the Virus Control plug-in and the physical controls on the Snow itself is revelatory. If you're one of the growing number of home and project studio owners who have replaced mixers with interfaces, and MIDI and audio leads with USB and Firewire cables, you'll find TI is a dream come true. Get a demo of the system in use or try it out first hand and you will be reaching for your wallet. The Direct button in each Virus Control part routes the part to the Snow's hardware outputs with near-zero latency, regardless of the buffer size in your DAW.So the Virus TI Snow is an unqualified success, then? Actually, no, I'm not sure it is. While it's a beautifully designed, immensely desirable synth, and I enjoyed every minute of using it, I have a serious reservation: namely, value for money. You just can't get away from the fact that another £400-500 on top buys a brand new Virus TI Desktop which, while not that much bigger, has the full knobby user interface, better polyphony, more audio and MIDI connections and, crucially, 16-part multitimbral capability. Not a big deal if you only ever play live, maybe, but using the Snow with a DAW I found I used up its four multitimbral parts in no time at all. As well as this being a limiting factor in the complexity of arrangements that can be achieved using those great Virus sounds (which you will want to layer up repeatedly), it also limits the usefulness of the TI concept as a whole. The more expensive Virus models could quite conceivably shoulder an entire, complex synth arrangement, leaving your computer's CPU free to run, say, samplers, audio tracks and plug-ins — a really attractive proposition, especially for laptop users or owners of slightly older machines. Not so with the Snow — you'll still need to rely on further hardware or software synths to fulfil many common types of production. If only Access could have squeezed eight parts out of the Snow, it would be a much more useful tool. Before I'm finished moaning, I've got a few more 'if onlys' too. I'm sure there are good reasons why this can't happen, but it would have been wonderful if the Snow could have run from USB power. Then you could have grabbed it, a laptop, and some headphones and done some serious work on the move. As it is, the power adaptor feels like an ugly encumbrance in many situations. And would it have been too far-out a concept for the Snow to have been conceived more along the lines of a mini TI Polar, with its simplified user interface married to a short keyboard? That, for many laptop-based and home studio users, could have made it the ultimate single add-on, fulfilling the role of DSP-driven synth, audio interface and portable controller keyboard all in one box. But the Snow is what it is. It's a fabulous sounding, inspiring synth in a dinky package — a serious musical instrument that will appeal to gigging and studio-based musicians alike. If you fancy adding a splash of Virus to your set-up, it's the cheapest option just now. But make sure it really does all you need it to before you discount the other Virus TI models. 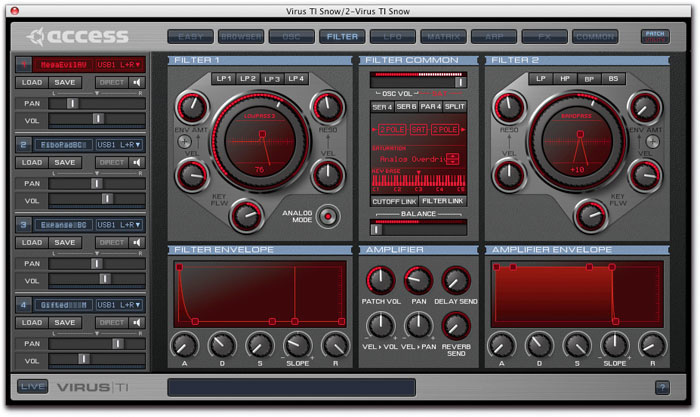 If you're looking for the ultimate in DAW/synth integration, there's simply nothing else that'll satisfy like the Snow — apart from another Virus TI model, that is. However, if your priority is live use, or you're comfortable using conventional MIDI-based communication with your DAW, three alternatives to the Snow stand out. Wavetable-based, and powerful in its own right, Waldorf's new Blofeld is around half the price of the Snow. Capable of 'up to 25 notes' of polyphony and 16 multitimbral parts, it's got undeniable pedigree and offers a lot for the money, including a convenient USB MIDI connection in addition to conventional MIDI sockets. Also undercutting the Snow, Korg's Radias needs to be taken seriously. It's less good at the dark, dirty timbres that the Virus manages so effortlessly, but in all other respects it's a great machine with ample polyphony for its four multitimbral parts. It also has a superb and very accessible vocoder, a plethora of arpeggiators, step sequencers and drum kits, USB MIDI, and patch-editing software for Mac and PC. Finally, don't discount the venerable Nord Lead 2X Rack. No on-board effects, but it's affordable, has drum maps, four multitimbral parts, and a fundamentally decent sound that has won it many admirers. Apple Logic 7.2.3 or higher. Steinberg Cubase SX/SL 3.1 or higher (Mac/PC). Pro Tools 7.3 M-Powered/LE/TDM or higher (Mac/PC). Ableton Live 5.2.2 or higher (Mac/PC). Image Line FL Studio 5 or higher. As Access suggest, though, you may also do OK in other versions of these hosts, or even in other hosts. As an experiment I did a bit of testing in my usual DAW, Digital Performer 5, and everything worked great except automation (I could manually write data for a few parameters, but nothing could be recorded) and arpeggio timing (all over the place unless I always started playback from the beginning of the sequence). Remember, too, that you're not bound to use the TI link with your computer — the Snow will sound just as good used as a conventional MIDI module running in Single or Multi mode. Classy, sophisticated sound that works for many genres — it doesn't get much better than this! The same synth engine as, and patch compatibility with, the more expensive TI models. Total Integration — now a mature and reliable system that you'll find hard to do without once you've experienced it. A bit pricey — not that much less than the TI Desktop and more than twice the cost of a Waldorf Blofeld. Clunky power adaptor that feels cumbersome on the road and precarious on stage. A little too expensive to be the 'Virus for the masses', the TI Snow is still a truly great synth that will appeal to live performers and studio musicians alike. Kemper Digital GmbH +49 236 1937 6824.